Connecting with the ways of our ancestors has always been my passion in life. This can only be done through working with nature, since we are nature like our ancestors were. Although far less idealistic than it was, this blog is still about this, just with a wider approach. It´s time to put on some winter gear again. It rarely gets very cold (-30F or below) around here these days, but we get periodic thaws almost every winter. Most winter days fall between that temperature range, so an Inuit-style parka would be overkill much of the time. My equipment of choice during cold conditions consists of a coyote fur parka, fur leggins and a beaver hat. 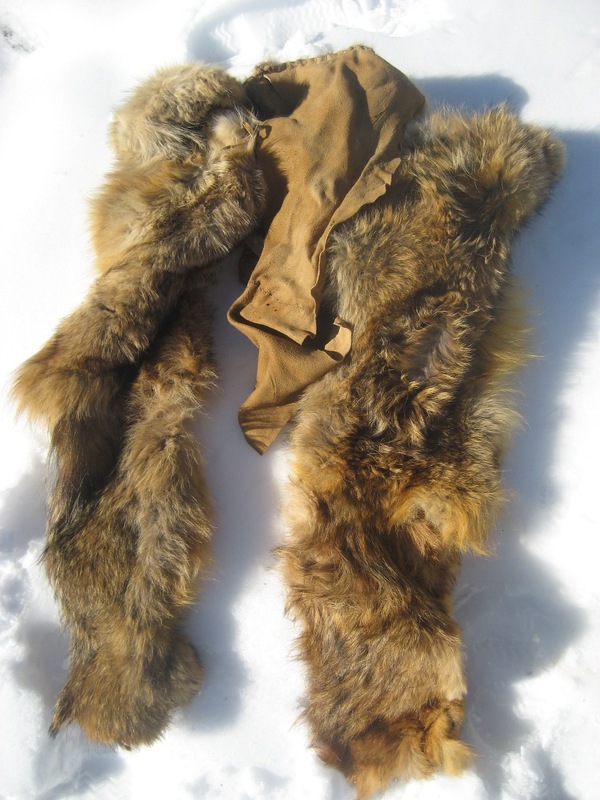 I chose coyote pelts because of their insulative value, light weight, and easy avalability (many people here hunt and trap coyotes, yet they still seem to maintain a thriving population). Pre-contact Natives of this area most likely used woodland caribou (which are now extinct here) for a lot of their winter clothing, much like many of the subarctic tribes did. Rear view of winter outfit. Notice how the parka shingles over the leggins – shingling layers is an important part of keeping body heat from escaping. The footwear is buckskin mukluks with canvas uppers. Part of the rear flap of the loincloth can be seen between the leggins. 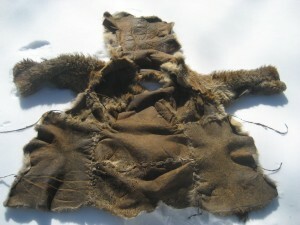 Now compare that to the coyote parka which has been used on a daily basis for more than one winter. The parka spread out with the inside up. 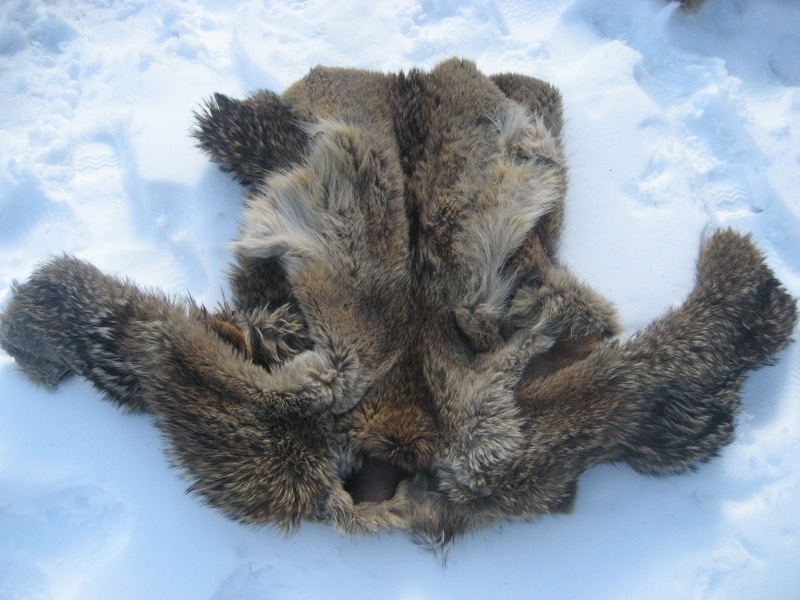 It consists of a front and rear panel (1 brain-tanned coyote pelt each), with side-flaps (half a pelt for each) sewn to both sides of the rear flap. Front and rear flap are sewn together at the shoulder/neck area, with a circular opening cut out for the head. The sleeves (1 pelt each) are attached at the shoulders with the armpits left open – this prevents excessive buildup of sweat. In warm weather, the parka can just be left dangling from the shoulders (much like a poncho). Since the armpits are open, it´s easy to put the sleeves on or off in this position. For more insulation, the side flaps can be tied together over the front panel (see tying strigs on the side flaps in the picture above) – this way all the exposed areas get closed up. For this parka I used no patterns; measurements were done by eye and by temporarily sewing the parka in a few spots to test & adjust. All the stiches on the parka are simple whip stiches with buckskin thongs as shown in the picture above. Coyote pelts are quite thin (which makes them fairly easy to tan) and yet strong and durable, so I wasn´t too concerned with elaborate stiching. After a season of heavy use I noticed though that the seams in the areas with a lot of stress/tension (such as where the sleeves are attached to the main body of the parka) had ripped in some spots. I reenforced those areas with a welt to lessen the tension on the seams. 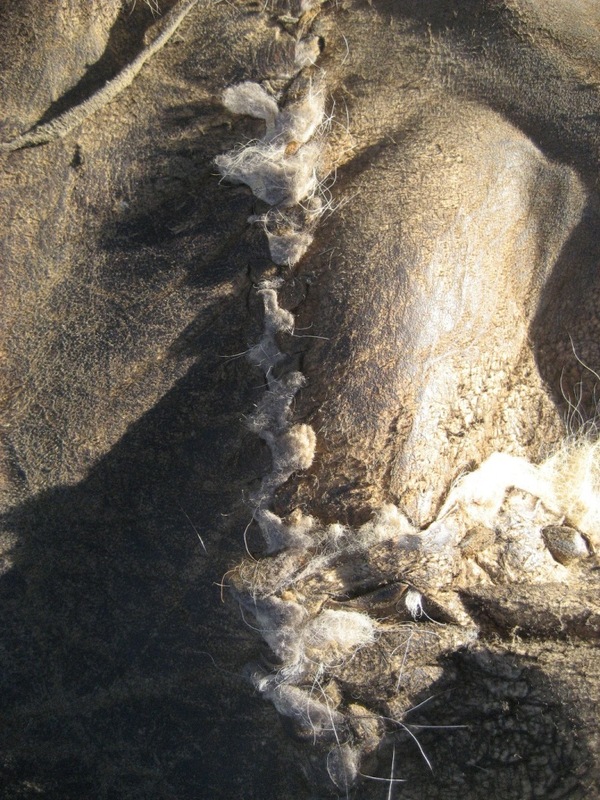 For an excellent article on making a fur parka of a similar design I recommend the article “Make your own Fur Parka” by Tamarack Song, Wilderness Way Volume 15 Issue 1. Unfortunately the magazine is no longer being published but you may find a used copy somewhere. Coyote fur leggins. Each leg cosists of two pelts sewn into tubes which overlap in the knee area. 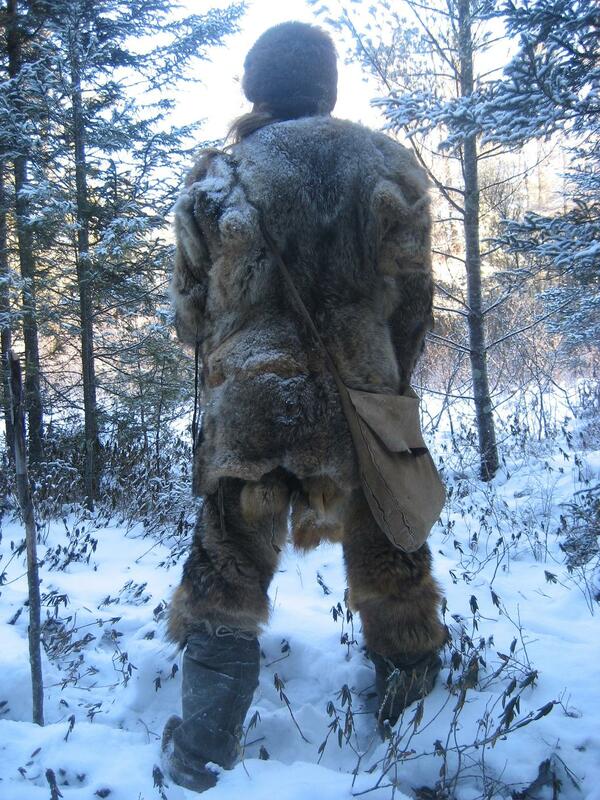 Because of the amout of streching that happens in that area, I only sewed the pelts in the back and to the side of the knee, with the upper pelt overlapping the lower one in front of the knee. I find that fur is usually too bulky and too warm for a loincloth (unless the hair is very short), so I decided to use a buckskin loincloth with a back flap of fur (folded under the buckskin section in the picture above and therefore not visible). Since the fur from the leggins already covers most of the hip and thigh area and the parka overlaps the upper part of the leggins, I haven´t noticed any drafts or coldspots with this design (which can sometimes be an issue with a leggins and loincloth combination). The back flap provides an instant insulating cushion for sitting down wherever one desires. The upper outer edge of each leggin is folded over and sewn so that a belt can pass through to hold up the leggins and loincloth. As with the parka, all stiches are whip stiches made with buckskin thong and a buckskin welt for reenforcement. As usual, I welcome any thoughts, questions, suggestions…if you made some of your own winter gear, I´d love to hear about how it´s been working for you and what you discovered in the process! I really like the way this looks, good job Thomas! I enjoyed your article. Coyote in my area are also hunted and traped to a large extent, and are still thriving. That makes it a good option for me in my “primitive journey”. Winter temperatures here mostly range -20 to -25c on everage. With drops to -30 at night at times, with lowest this year being -36c. It depends on the temperature whether I wear anything underneath the parka or not. If I do, I usually use a buckskin shirt – that combination has kept me warm even with 20 or 30 below F plus windchill. At one point I used a buckskin shirt with sleeves too but it made it a lot harder to get in and out of the parka sleeves. It sounds like a parka made of coyote or a similar furbearer should definitely work with your temperature range. I think that Native people in this area (Great Lakes region) did pretty much the same – a combination of furs and buckskins. Once you get further north some tribes used two fur parkas – one inner layer (usually thinner fur) with the fur side in, and the outer layer with the fur side out. 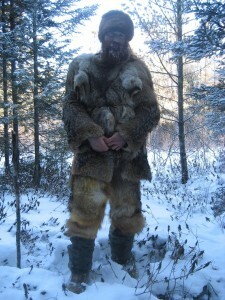 Of course, once you get into (sub-)arctic regions, most people used two heavy sets of furs (e.g. inner and outer garment of caribou). With coyotes, I´d definitely use winter fur for winter clothing. Their summer pelts are a lot less insulative. Fur facing in, fur facing out. What are the advantages and disadvantages of the fur facing out? What are the advantages and disadvantages of fur facing in? my own experience and the research I´ve done shows that clothing with fur facing in retains the body heat better than facing out. The fur traps pockets of still air between the wearer´s skin and the outer skin of the garment, much like the insulation in a sleeping bag. On the other hand, the fur side will shed precipitation (snow, rain) better than the skin side, provided that the fur is facing down. 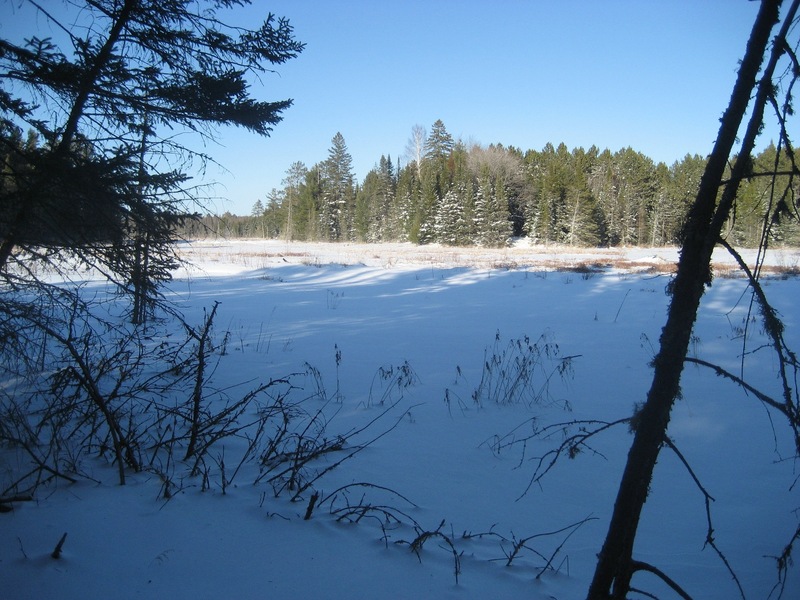 Having the fur outside makes my parka more versatile for the varied winter conditions of the northwoods, and I usually stay plenty warm in it. If I was to live in a colder (and drier) climate, I would probably turn the fur inside out. Most of the arctic and subartic tribes of North America I know of had a fur-inside garment for summer use, and would use an additional outer layer with the fur facing outwards in the wintertime. Hey, I just wanted to ask if anyone was willing to sell a tanned hide to me? I don’t have much time to make my own ( I have done a small fox before) but what I want to do is make myself a shirt or moccasins. Should try the feet first. Anyhow if anyone is interested in selling a hide for cash or if they need something else I am up for a trade. I will be fascinated and also considering what you really are writing about the following. Hello. Because you’re an outdoor enthusiast, I must ask. Are you near any eco villages(groups of people doing primitive skills, together)? Which region do you live in? The north of north America? I’m in massachusetts, searching for people who share their skills. Hello,I read your blogs named “Living Primitively » Winter clothing – Part 1: Fur parka and leggins” regularly.Your writing style is awesome, keep it up! And you can look our website about free proxy list. Site Admin | Free WordPress ThemeLiving Primitively Copyright © 2019 All Rights Reserved .